When we moved to this region of the United States, considered part of “The South,” I discovered the magnolia tree. 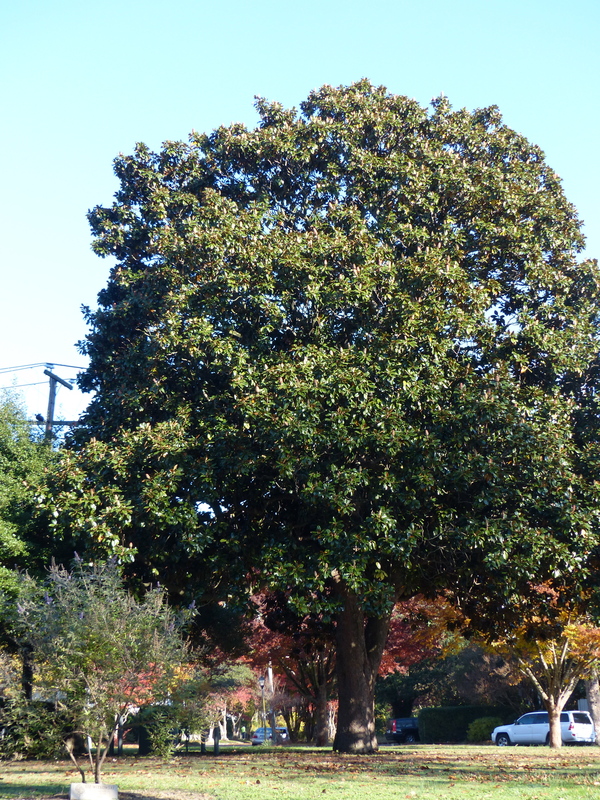 Magnolia trees are the baobab of the American South. Distinctive and unique to this region, the massive blooms and richly colored foliage can be found in backyards and botanical gardens alike. The colors of the leaves that float off the branches are the quintessence of autumn hues – alabaster, pumpkin, dusty bronze, saffron and bisque. 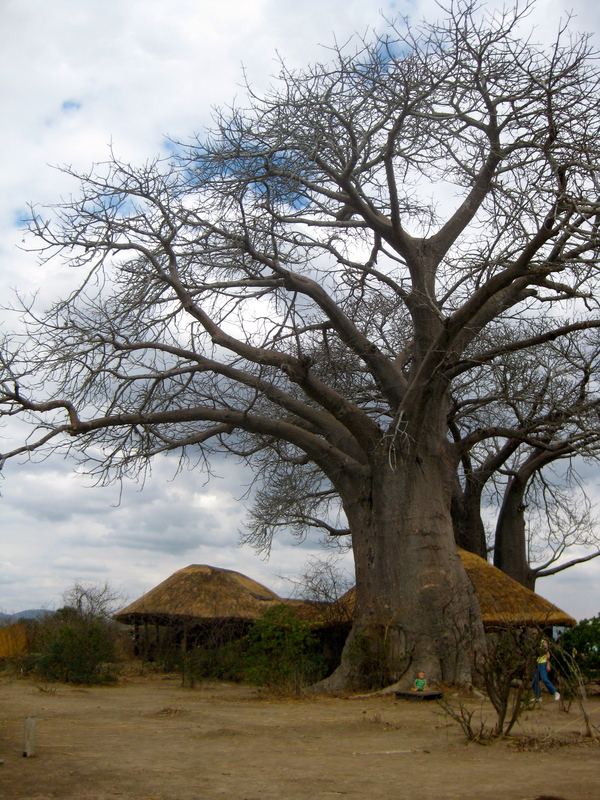 This, of course, is a baobab tree, a classic in Southern Africa. My local magnolia tree, equally iconic in this region, sparingly drops thick, glossy leaves. Noticing colorful collections of these leaves along fence lines and barriers where the wind had blown them, I recently thought they would look attractive arranged in a wreath. 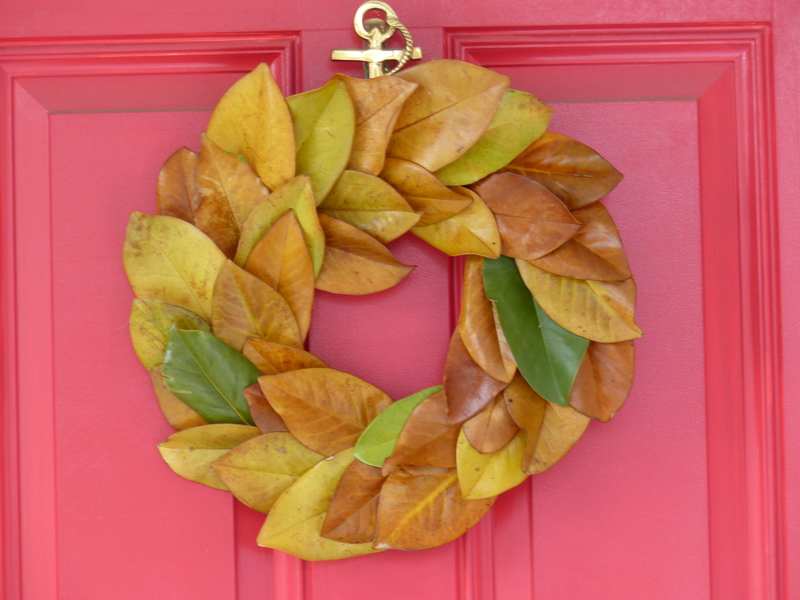 I appreciate a seasonal wreath hanging on the front door as a warm welcome to guests. A circle of locally scavenged leaves from the southern beauty seemed a novel idea, and particularly fitting while we live in a region where it is accessible. I wonder if this has ever been done before? If you are from the South, you are chuckling quietly at my naiveté. 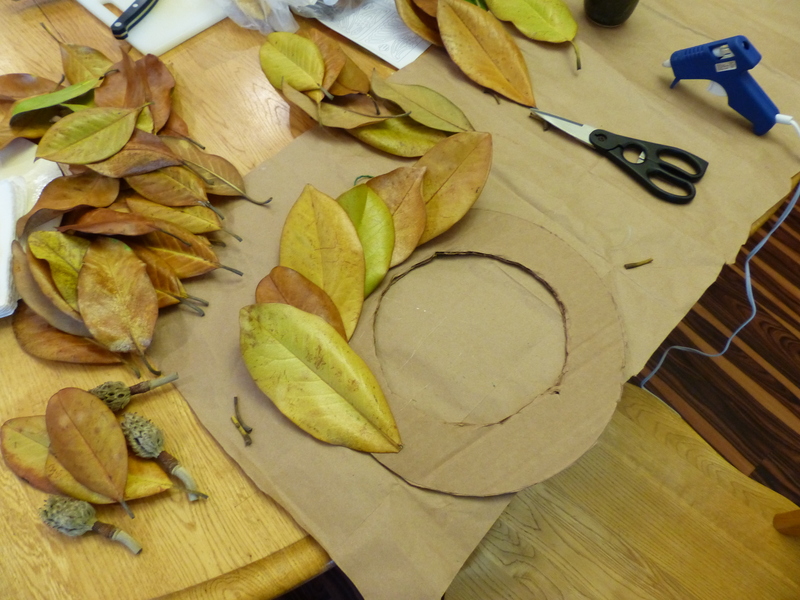 I google search ‘magnolia leaf wreath image’ and find thousands of photos and ideas for a magnolia wreath. Apparently they’re a staple around here. I am reminded of a foreign friend to whom my family introduced peanut butter. They loved it and called several days later to ask if we’ve ever tried it with jelly, because ‘peanut butter is delicious with jelly.’ Indeed. 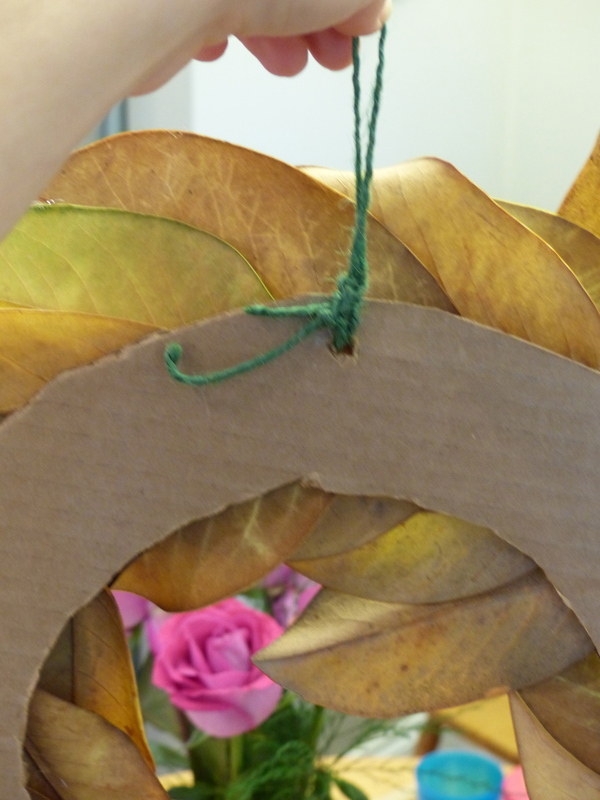 My research on wreath creation suggested items such as foam and floral wire. We’re a cardboard, paper sack, tape kind of family, though I did recently buy a glue gun. 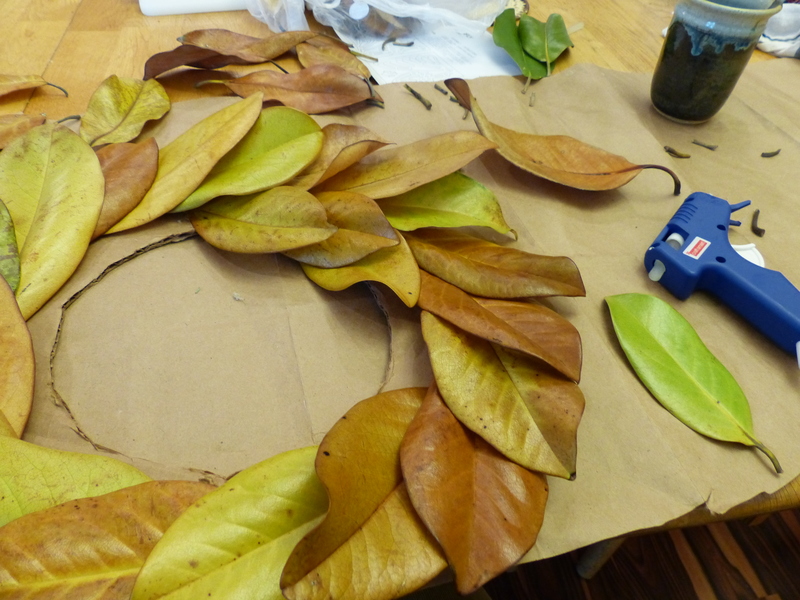 Those supplies are plenty sufficient to create a wreath. With my trusty assistants who helped collect, then trimmed stems and sorted leaves, we created this seasonal décor with a nod to our “Southern” locale. We won’t always live near magnolia trees.